UPDATE: See comments for an update. It seems the course may have fallen on hard times since my last visit. 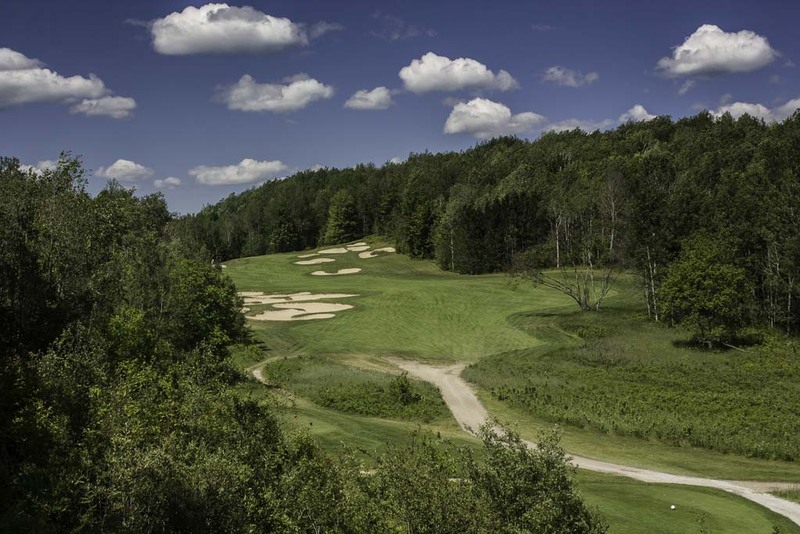 Located in Gaylord, Michigan, Black Forest is one of GolfWeek’s Ten best public courses in Michigan. Considering that the state has more than 800 public courses, that’s high praise. I also think it’s mostly deserved. For this GolfBlogger, the most lasting impression of Black Forest golf course was of size. It’s BIG. Spread over 400 acres, Black Forest uses every inch to its advantage; an employee told me that there are seven miles of cart paths. Black Forest was designed by Tom Doak, who has gained fame as the minimalist architect of such courses as Pacific Dunes and Cape Kidnappers. Doak’s philosophy is to let the ground dictate the holes, rather than impose his will on the landscape with a platoon of bulldozers. It’s the right approach, assuming that the tract of land you’re working on has character. Doak’s quest to find holes, rather than create them shows in the course routing. On most holes, there’s a great deal of distance from green to new tee. Others are right next door. But with just two exceptions, I think they all were terrific finds. Two other design features of Black Forest stand out. The first are the greens. Unlike other resort area courses that let players pump their greens-in-regulation stats with landing zones large enough for helicopters, Black Forest’s are relatively small and tough. On several holes, they’re deceptively so. Many of the greens are significantly elevated, creating a plateau effect and leading to a misjudgment of depth. A couple are nestled behind swales or bends. Because of these, more than once, I aimed at and hit what I thought was a landing zone only to find greenside rough. The second design feature are large number of bunkers and their irregular, unkept look. At first, I thought it was just a lack of grooming, but later decided that the intent was to add to the character of the course. The course is in the wilderness, so perhaps it’s appropriate that the bunkers look a little wild. Black Forest has five sets of tees. It measures 7,044 yards from the tips with slope of 147, and 6,129 with a slope of 127 from the whites (men’s forward tees). I played from the whites, and found it a tough, but fair test. It’s a cliche, but I think the course really calls for you to use every one of the clubs in your bag. If you simply bang the ball into the distance, you’re going to get into trouble with bunkers, or with a bad angle for an approach shot. That’s good course design in my opinion. Tom Doak forces you to think your way around the course. To paraphrase Yogi Berra: Golf is 90% mental; the other half is physical. There are many outstanding holes on the course but my favorite was the eighteenth (top left). It’s by far the most picaresque, but also, I think the most fun. The tee box is a good hundred and fifty feet above the fairway, and a well struck shot will soar long and far into the distance. Bunkers abound to the left, but there’s plenty of room on the right. Your second shot needs to put the ball on the left foot of a hill upon which the green is perched. I also really enjoyed the tenth, which is a 532 yard par five that starts on an elevated tee, then sweeps down and left to the hole, tucked in the trees. Toughest on the course has to be the 238 yard par 3 fifth. It’s uphill across a ravine to another of those smallish greens. Brutal. The one negative for the course is that it was very slow on the day I played. The round took a completely unacceptable six hours. My advice: get an early tee time and get ahead of the crowds. I can’t recommend a late morning or early afternoon slot. This Black Forest Golf Course review was first published August 25, 2009.